This rare hand colored map is a copper plate engraving, dating to 1855 by the well known 19th century American Mapmaker J. H. Colton. It is a representation of the North Pole and is formally titled 'Northern Regions.' 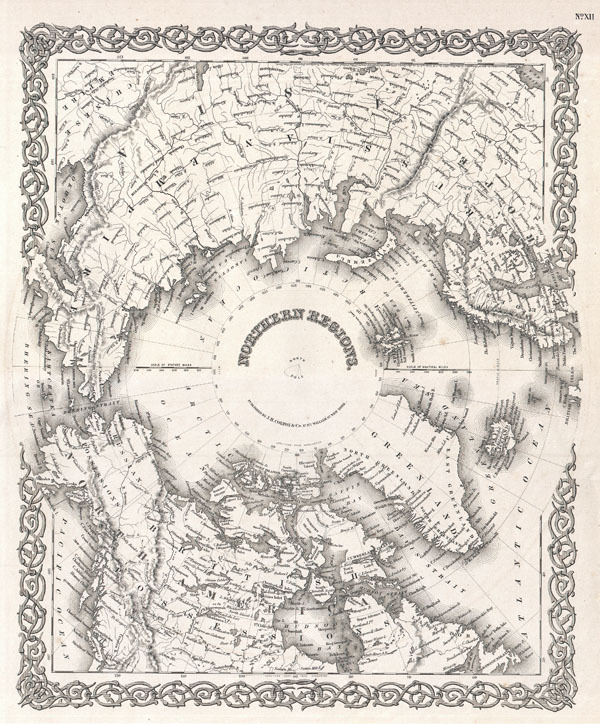 This is a rare and historically important map as the polar regions were still relatively unexplored when it was drafted. The Northwest and Northeast Passages are delineated and most of the coastlines of North America, Europe and Asia are shown with relative accuracy. Published from J. H. Colton's 172 William Str. Office in New York. Very good condition. Minor toning. Blank on verso. Rumsey 0149.009. Phillips (Atlases) 816.